With regret, there won’t be a 2013 Smiling Blue Skies Walk to End Canine Cancer in Bradford this year. Life got in the way and I wasn’t able to commit to a date. We will, however, be back full-strength for next year and we hope you’ll be able to join us! In the meantime, however, Kelly, of Kelly’s Dog Walking ( http://www.kellysdogwalking.com ) will be holding her Toronto walk on September 28, 2013. We attended her inaugural walk last year and had a terrific time ! Kelly’s team raised close to $40,000 for K9 cancer research! Fabulous job! With great joy, we have welcomed a new addition to our pack. 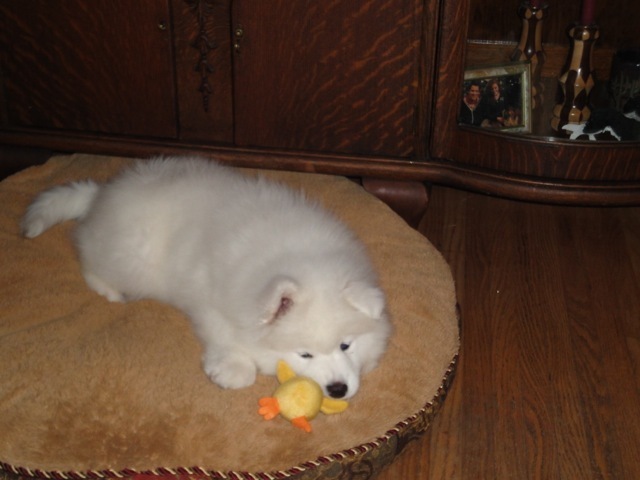 I would like to introduce ICE – a beautifully fluffy samoyed from Vanderbilt Samoyeds: http://www.vanderbiltsamoyeds.com/02/home.html . Ice has already been awarded his first 2 points towards his CKC Championship. He’s very eager to earn many more over the summer months with hopes to add some alphabet soup to his registered name. Ice is being expertly handled and loved by Diane Gray of Windmoor English Setters: www.wix.com/DDGRAY/windmoorenglishsetters . There are varied drugs for various diseases. Nowadays, web is the cost effective method to buy any drugs for any needs. Certainly, the nomenclature is quite long. If you’re concerned about sexual disfunction, you have to know about “viagra on line” and “buying viagra online“. Currently many people search online for the exact phrase “buy viagra online” on the Internet. Divers companies describe it as “undefined”. What can lead to erectile dysfunction? Divers diseases can damage nerves. Along with their good effects, most medicaments, even so, have dangerous aftereffects although generally not everyone experiences them. Throw away any generic that is no longer needed. For example the liquid medications ideally have to be kept in the cool place, but also may be stored at room temperature.